Once upon a time, I was at a potluck supper and found myself walking past the dessert table on my way to the end of a long buffet line. I snagged a little round chocolate something and took a bite… and found myself with a little nugget of chocolate chip cookie dough dipped in chocolate! Part of me wanted to tell everyone in line about this amazing little treat, but the rest of me wanted there to still be some left when I went through the dessert line for real! 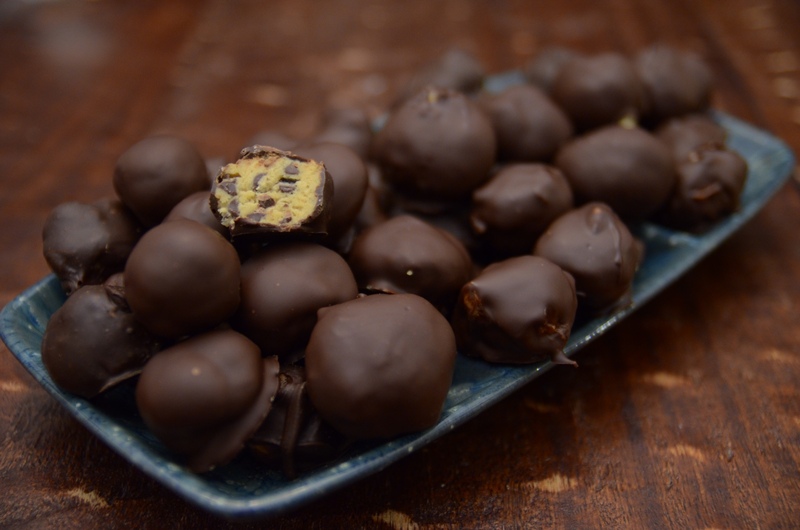 I have been looking for an excuse to make these Cookie Dough Truffles ever since. Christmas Cookie Week seems like a good time. (Cookie dough qualifies it as an acceptable recipe, right?!) I’ll be packaging these up as gifts for my boys’ teachers–that is, if we don’t eat them all ourselves! The inside of the truffle is basically the same as the dough for chocolate chip cookies, except without the eggs and baking soda. 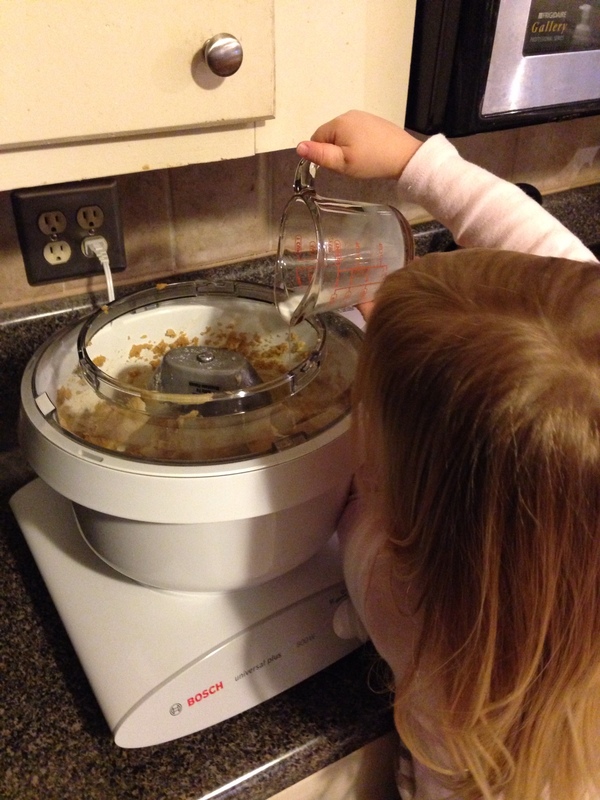 And you use mini chocolate chips, which my daughter found quite charming! Then you chill the dough for an hour, which is just enough time to pick the big kids up from school and give them a snack before you put them to work rolling the dough into balls. 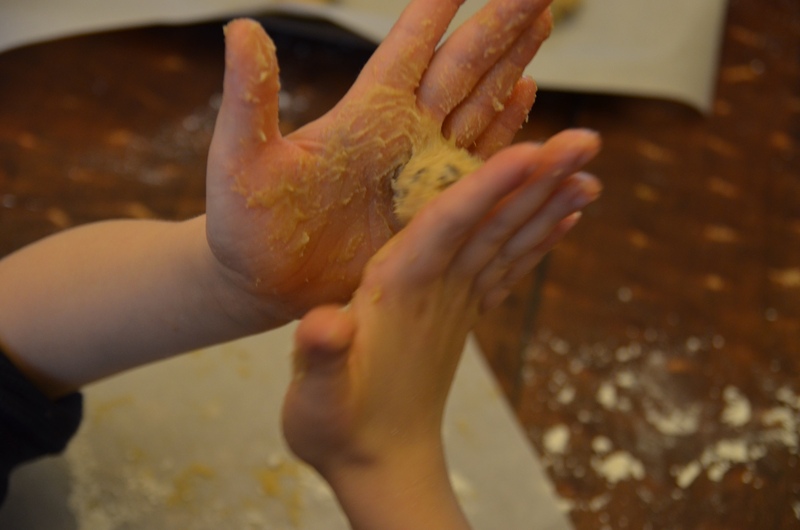 You might want to lightly flour kids’ hands for this part. For some reason their hands were a lot warmer than mine and things got a little sticky! The smoother the dough balls, the prettier the final product will be. Pop the baking sheet of dough balls into the freezer for 30 minutes to get them nice and firm and ready for dipping. Everything I know about melting chocolate and dipping things in it, I learned from this video tutorial. 🙂 Place the dipped dough balls back onto the parchment paper-lined baking sheet and let them chill in the fridge until set. 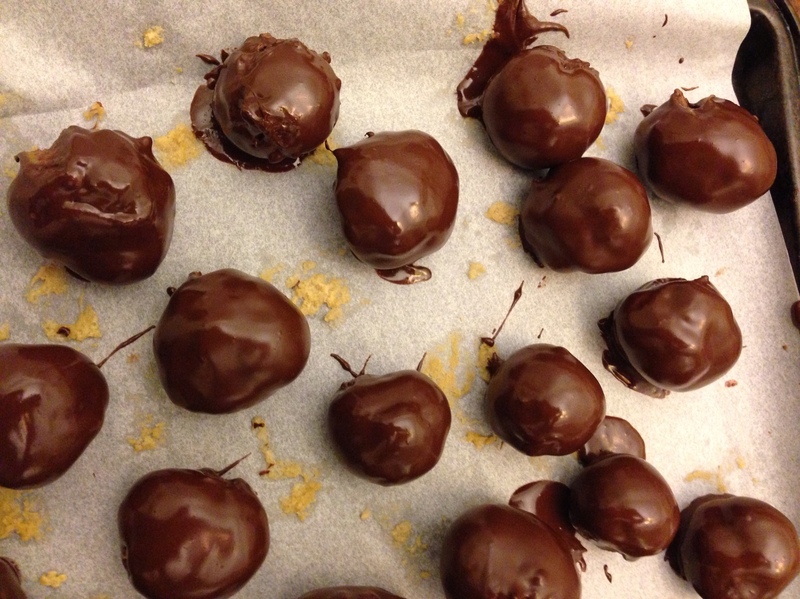 Since this was my first truffle-making adventure, I was nervous about the chocolate-dipping part. 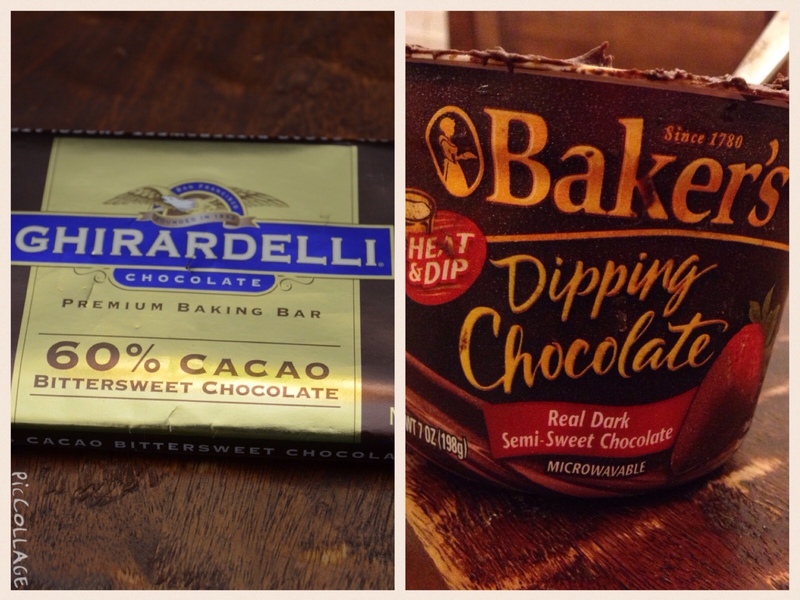 That’s why I originally bought the “cheater” tub of dipping chocolate (below, right). But I found that chocolate to be thick and hard to work with… and also not enough for all the truffles. So on my second trip the grocery store, I bought the bars of Ghirardelli semi-sweet chocolate and followed the video instructions. 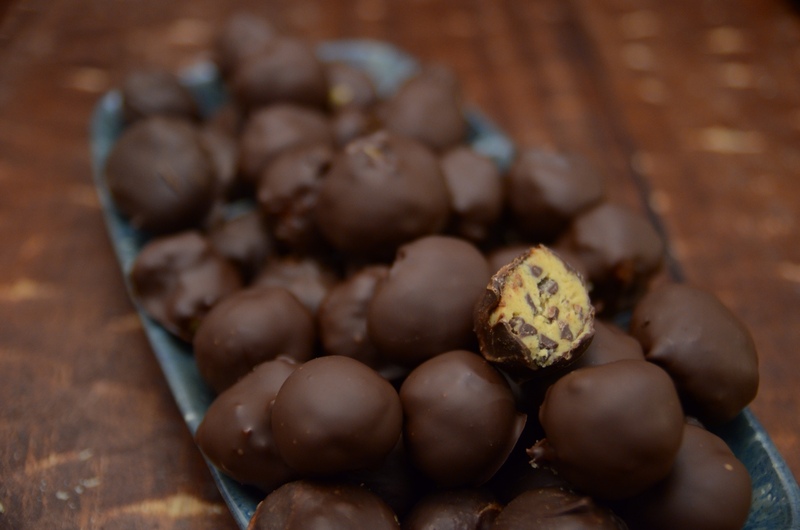 The truffle on the left was dipped in Ghirardelli bar chocolate. 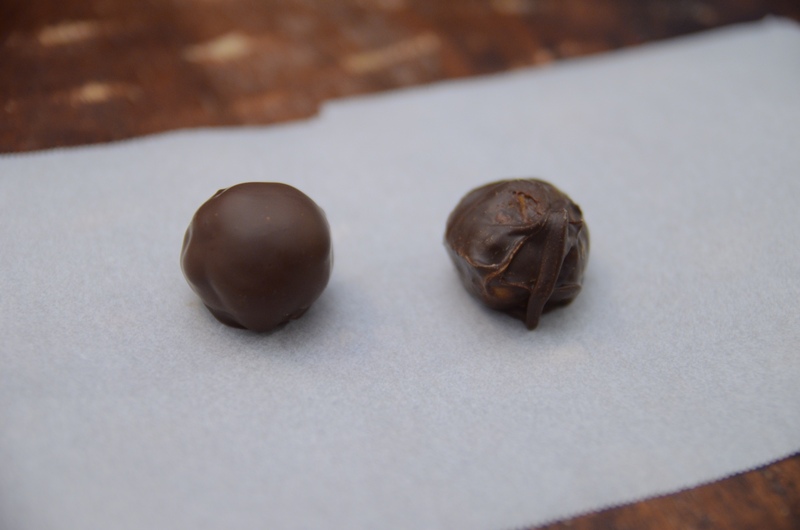 The truffle on the right was dipped in the tub of Baker’s dipping chocolate. You be the judge. 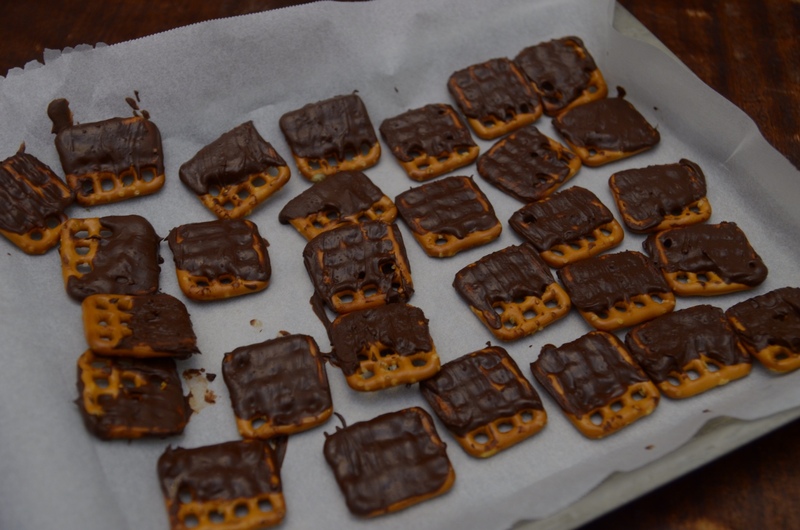 Oh, and if you have melted chocolate left over, use it up by dipping pretzels in it! And if your husband is anything like mine, he’ll be happy to take care of clean up for you! Inside-out ice cream sundae, anyone? Beat butter and sugars on medium speed until light and fluffy. Add vanilla and milk/cream. Mix in flour and salt on low speed. Stir in chocolate chips. Cover dough and chill in fridge for one hour. 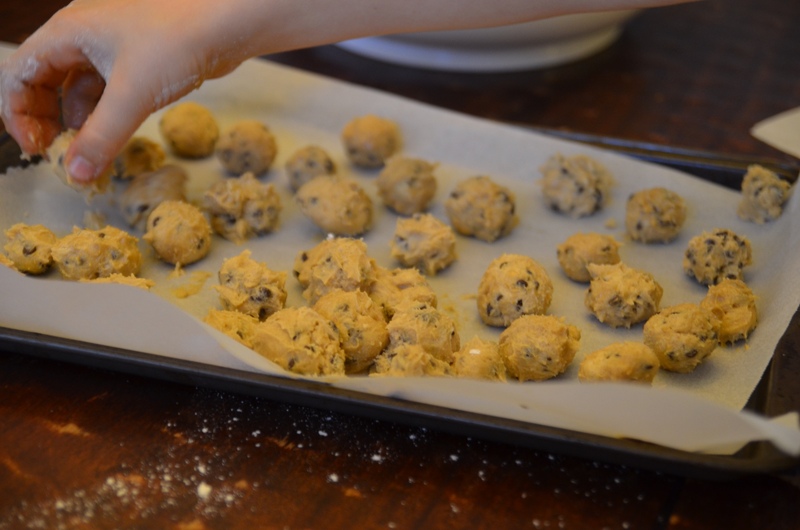 When dough is chilled, form dough into 1″ balls. Place on baking sheet lined with parchment paper. Place sheet in freezer for 30 minutes. 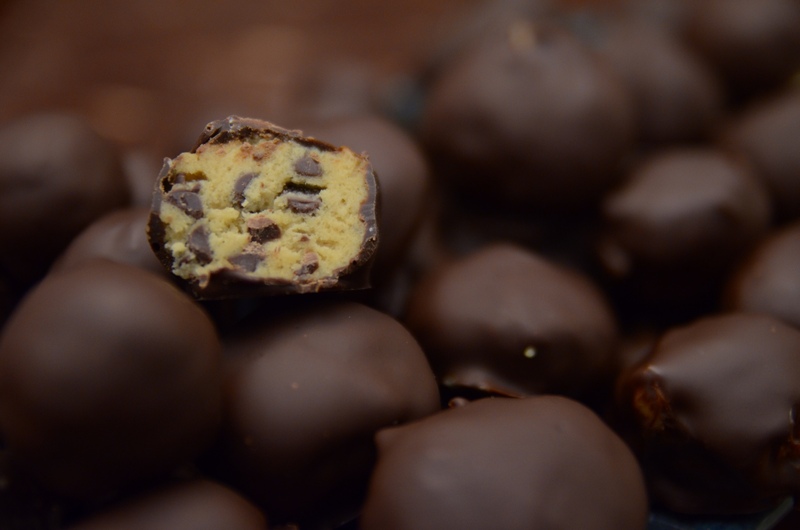 Drop a cookie dough ball into the chocolate. 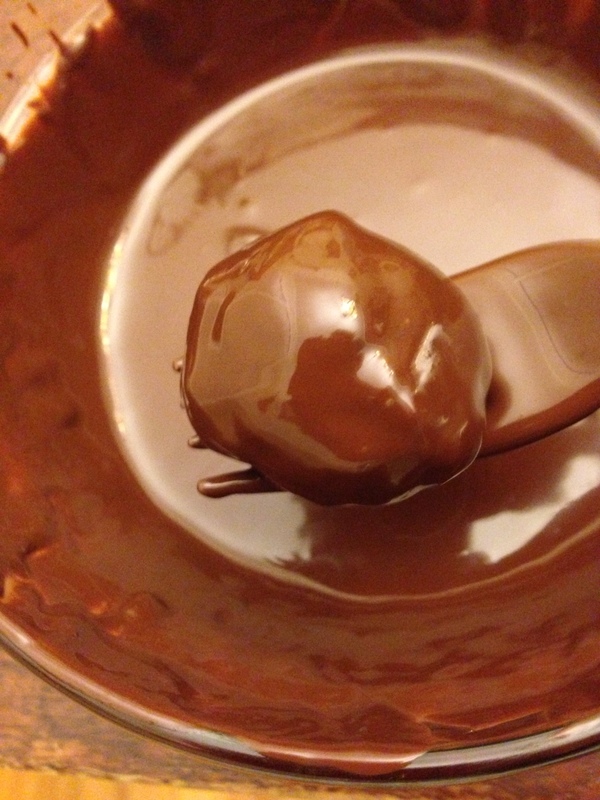 Use a fork to plop chocolate all over the ball. Scoop the ball up on the fork. 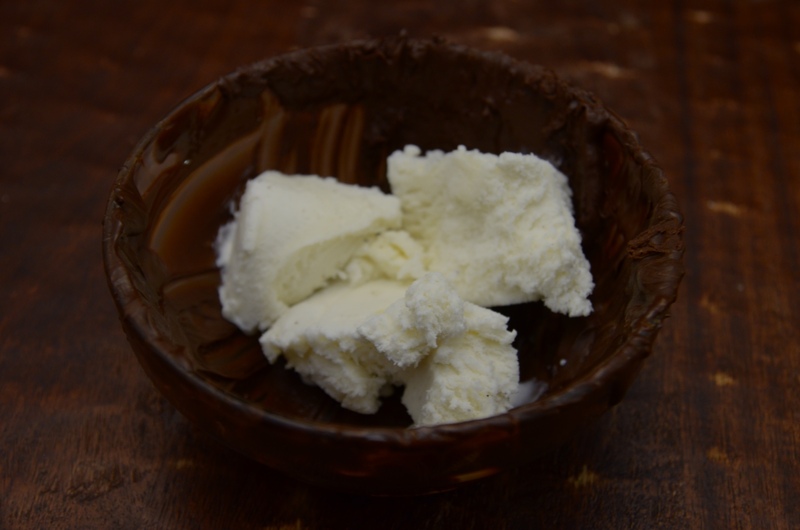 Tap the fork against the bowl to remove excess chocolate. Scrape the bottom of fork on the edge of the bowl. Use a knife to slide the chocolate-covered ball off the fork and onto a baking sheet lined with parchment paper. Chill in fridge until set. Yes, I know. I have TWO brilliant daughters! These truffles sound dangerous. Also, I think Nonnie should qualify as one of “the boys’ teachers”. I know what I’ll be doing this afternoon. So much for that to do list….. I love your new blog, Bet!!! Yummy! I’m off next week and hope to do some baking then. These might just have to get on my list!